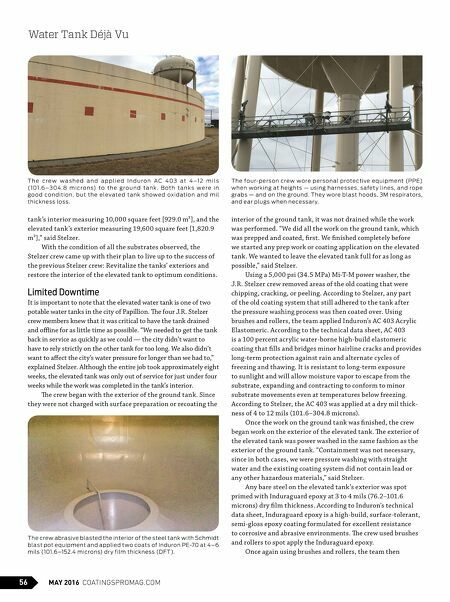 56 MAY 2016 COATINGSPROMAG.COM tank 's interior measuring 10,000 square feet [929.0 m²], and the elevated tank 's exterior measuring 19,600 square feet [1,820.9 m²]," said Stelzer. With the condition of all the substrates observed, the Stelzer crew came up with their plan to live up to the success of the previous Stelzer crew: Revitalize the tanks' exteriors and restore the interior of the elevated tank to optimum conditions. Limited Downtime It is important to note that the elevated water tank is one of two potable water tanks in the city of Papillion. Te four J.R. Stelzer crew members knew that it was critical to have the tank drained and ofine for as little time as possible. "We needed to get the tank back in service as quickly as we could — the city didn't want to have to rely strictly on the other tank for too long. We also didn't want to afect the city's water pressure for longer than we had to," explained Stelzer. Although the entire job took approximately eight weeks, the elevated tank was only out of service for just under four weeks while the work was completed in the tank's interior. Te crew began with the exterior of the ground tank. Since they were not charged with surface preparation or recoating the interior of the ground tank, it was not drained while the work was performed. "We did all the work on the ground tank, which was prepped and coated, frst. We fnished completely before we started any prep work or coating application on the elevated tank. We wanted to leave the elevated tank full for as long as possible," said Stelzer. Using a 5,000 psi (34.5 MPa) Mi-T-M power washer, the J.R. Stelzer crew removed areas of the old coating that were chipping, cracking, or peeling. According to Stelzer, any part of the old coating system that still adhered to the tank after the pressure washing process was then coated over. Using brushes and rollers, the team applied Induron's AC 403 Acrylic Elastomeric. According to the technical data sheet, AC 403 is a 100 percent acrylic water-borne high-build elastomeric coating that flls and bridges minor hairline cracks and provides long-term protection against rain and alternate cycles of freezing and thawing. It is resistant to long-term exposure to sunlight and will allow moisture vapor to escape from the substrate, expanding and contracting to conform to minor substrate movements even at temperatures below freezing. According to Stelzer, the AC 403 was applied at a dry mil thick- ness of 4 to 12 mils (101.6–304.8 microns). Once the work on the ground tank was fnished, the crew began work on the exterior of the elevated tank. Te exterior of the elevated tank was power washed in the same fashion as the exterior of the ground tank. "Containment was not necessary, since in both cases, we were pressure washing with straight water and the existing coating system did not contain lead or any other hazardous materials," said Stelzer. Any bare steel on the elevated tank 's exterior was spot primed with Induraguard epoxy at 3 to 4 mils (76.2–101.6 microns) dry flm thickness. According to Induron's technical data sheet, Induraguard epoxy is a high-build, surface-tolerant, semi-gloss epoxy coating formulated for excellent resistance to corrosive and abrasive environments. Te crew used brushes and rollers to spot apply the Induraguard epoxy. 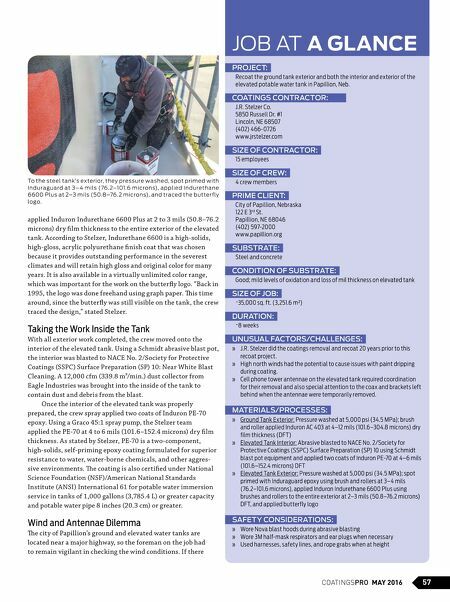 Once again using brushes and rollers, the team then The crew abrasive blasted the interior of the steel tank with Schmidt blast pot equipment and applied t wo coats of Induron PE-70 at 4–6 mils (101.6–152.4 microns) dr y film thickness (DFT). Water Tank Déjà Vu T h e c r e w w a s h e d a n d a p p l i e d I n d u r o n AC 4 03 a t 4 –1 2 m i l s (101.6 –304 . 8 m i c r o n s) t o t h e g r o u n d t a n k . B o t h t a n k s w e r e i n go o d co n d iti o n , b u t th e elevate d t an k s h owe d ox i d ati o n an d m il thickness loss. The four-p er s on crew wore p er s onal protec ti ve equipment (PPE) when working at height s — using harnesses, s afet y lines, and rope grabs — and on the ground. They wore blast hoods, 3M respirators, and ear plugs when necessar y.